Fire safety and building code standards are constantly changing and with that new fire rated products are developed and old ones are improved. When there is a fire, removing everyone from the building quickly and safety is a top priority. Fire rated glass installed into doors and windows offer a barrier of resistance to fire and smoke with ratings ranging from 20 minutes to 3 hours giving people time to exit safely. Installing wired glass into a door or window requiring fire rated glass is now considered a violation of code. Flower City Glass offers fire rated glass that comes both optically clear and wireless. For installation in areas where human impact safety requirements exist, fire rated clear glass-ceramic or laminated clear glass-ceramic are the way to go. This option is ideal for use in schools and public facilities. 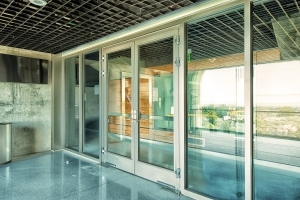 Fire rated glass can be installed into doors, side-lites, windows, transom, and borrowed light assemblies that have been designed for fire protection. Offering comparable output of light and visibility, fire rated glass looks and performs as well as contemporary glass. We carry Vertrotech Keralite® fire rated glass door-lites, transoms, side-lites and door assemblies, UL rated for 20-180 minutes. Flower City Glass is the only Rochester and Syraucse, NY area company that is authorized by Underwriters Laboratory (UL) to both cut and label fire rated glass for use in both residential and commercial glass installations. This means that when you need a new piece of fire rated glass Flower City Glass can process your exact size orders in house and have it delivered in 2-5 days.